Macs of varying vintages can run a number of operating systems, mostly those offered by Apple. Many Macintosh computers built for the Power PC G3 chip and higher, as well as all Macs built with Intel chips can all run some version of Mac OSX. Mac OSX can only be run on Apple Macintosh hardware. Hacks to the OS has allowed some versions of OSX to run on the PC platform. 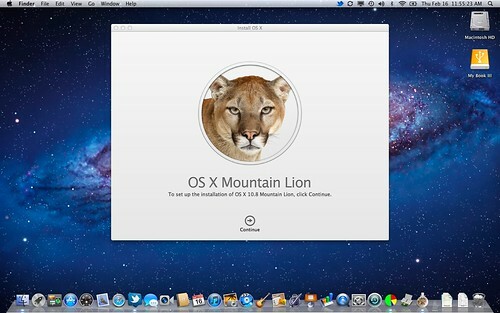 Mac OSX – The current version is “Mountain Lion” – Mac OS X 10.8.x. This OS runs only on Intel Macintosh systems as it has been since “Snow Leopard”, Mac OS X 10.6.x. The next version of OSX is “Mavericks” (10.9.x) which is scheduled for release in the fall of 2013. COMMENTARY: My 2011 MacBook Pro now runs “Mountain Lion” (OSX 10.8.5) and my 2009 MacBook Pro continues with “Snow Leopard” (OSX 10.6.8). My Power PC G4 tower alternates between OSX 10.3.9 and 10.4.11. My iBook 700 runs OSX 10.4.11. Both Power PC Macs also run Mac OS 9.2.1 in emulation. Unix: Underneath the pretty OSX user interface lies Unix. Users can access the Unix command line by launching the Terminal application that resides in OSX’s Utilities folder. Once launched you can do stuff within the Unix structure using the command line. There are volumes of books and websites dedicated to the use of the Unix command line. Linux: A number of Linux distributions such as the popular Ubuntu desktop can be run on Intel based Mac hardware. Microsoft Windows: Intel Macs can boot into Microsoft’s Windows operating system using a virtual machine software or natively through “Boot Camp”. Windows XP, Windows Vista, Windows 7.x and Windows 8 are supported. iOS is Apple’s mobile operating system developed for the iPhone. It now supports Apple’s iPod Touch, iPa and the second-generation Apple TV. iOS is a proprietary operating system that only runs on Apple manufactured hardware. The current version is at iOS 7, released on September 2013. The only Apple device I own that runs iOS is a 4th generation Apple iPod Touch which has reached the end of the line for iOS updates at version 6.1.3. Mac OS 9.x running on Apple Power Mac G4 with custom desktop. Mac OS 9.x – Runs on Power PC Macs up to several G3 and G4 desktops, Powerbooks and iBooks. Does not work on G5 Macs. My Power Mac G4 can boot into OS 9.2.1 or run in “classic mode” (emulation) through OSX 10.3.9 or 10.4.11. Mac OS 9.2.1 is also installed on my iBook 700 laptop. Mac OS 8.x – Runs on many Power PC Macs (602, 603, 604, G3). The most stable is Mac OS 8.6 which ran on my Powerbook 3400 as well as Power Mac 9500. Mac OS 8.1 ran on my PowerCenter 150 Mac clone. Mac System 7.x – Runs on older Mac Power PC Macs (601, 603, 604 based) and many clones. Versions of Mac System 7 (up to 7.5.5) also run on older Motorola 680×0 Macs. I’ve used System 7.0 on a Mac Plus, System 7.1.2 on a Mac IIsi, System 7.6.1 on a Powercenter 150 Mac Clone and Apple Macintosh Performa 6360. System 7.5.5 ran on a Performa 6200. Mac System 6.x and earlier – For various 680×0 Macs only. Also runs in emulation using miniVmac software. System 6 works well with early all in one Macs such as the Mac Plus and Mac SE series. Prior systems in the such as System 3.2, System 4.2 ran on many of the early Macs. I have System 6.08 running on my Mac Plus and in emulation via miniVmac. I also had a Mac SE and Macintosh II running System 6.08 at one time too. A/UX: Apple’s early version of Unix. For the most part these do not run on Apple hardware, past or current.